From part way up on the slope, there’s a good view to the north of Mt. David Douglas on the left and the gentle south side of Fuji Mountain on the right. 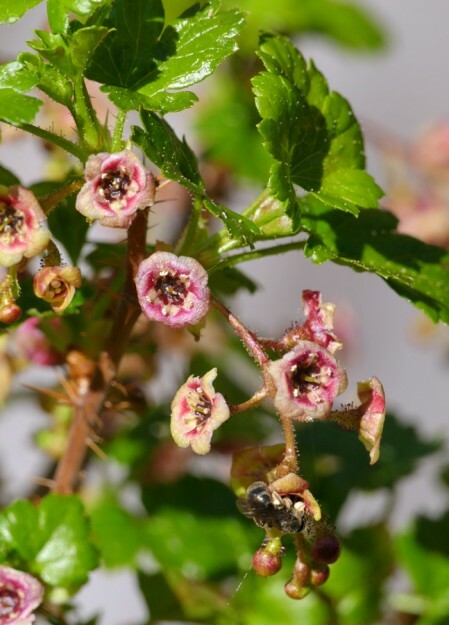 A small bee visiting the equally small flowers of swamp currant (Ribes lacustre). Last year, John Koenig, Sabine Dutoit, and I spent a great day at Lopez Lake and other interesting spots near the end of Road 5884 (see Glorious Day Near Lopez Lake), east of southeast of Oakridge. I went a short ways up the talus slope at the terminus of the road, but that only whetted my appetite to get close enough to the cliffs at the top and left sides of the slope to see what grew on them. So that was my main goal last Sunday, June 7. It was a very warm day, so I headed to the cliff first. Rather than plowing through the large alder thicket and walking up the large boulders in the middle like I did last year, I decided to follow a small creek at the left edge, hoping to get to the north-facing cliffs along the side. No doubt this area was an old quarry, and it left a sharp cliff below the forest on that side of the slope and some flatter areas on the way up. This turned out to be a very good way to get started, as I avoided the majority of the alders. I also saw some beautiful, perfectly blooming stink currant (Ribes bracteosum) and other wetland plants. 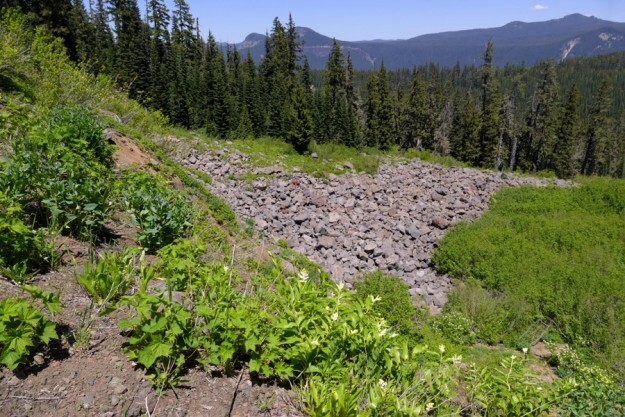 There was obviously quite a bit of moisture coming down from above, and one of the interesting things about the area was how many plants there were on this rocky slope that one would expect to see in a wetland or a forest. Many clumps of tall bluebells (Mertensia paniculata) were in bloom almost all the way up the 300′ slope. The moisture-loving swamp gooseberry (Ribes lacustre) also grew among the rocks as well as at the edges of the wetlands I visited later in the day. On the somewhat more level section about halfway up, there was a gorgeous display of false Solomon’s seal (Maianthemum racemosum) and another “woodland” plant, red baneberry (Actaea rubra). This also seemed like a strange place to see so much Fendler’s waterleaf (Hydrophyllum fendleri) and Sitka valerian (Valeriana sitchensis). 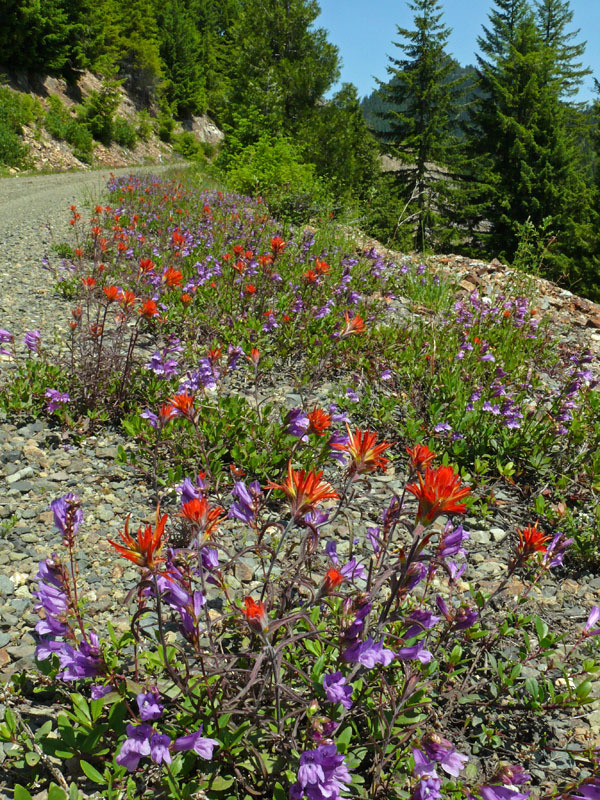 Gravel road is ideal habitat for Cardwell’s penstemon (Penstemon cardwellii) and frosted paintbrush (Castilleja pruinosa). 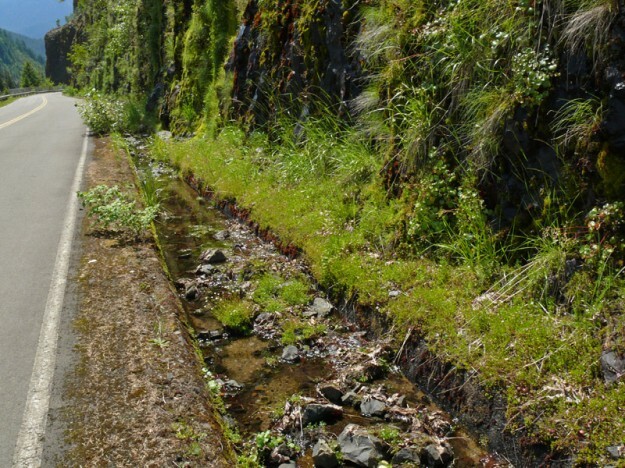 The stream running down the concrete-lined ditch along the base of the cliff is filled with plants that have seeded or fallen down from above.